This feature is currently in beta phase. This is a guide for developers who are interested in writing a Go extension to the Envoy proxy as part of Cilium. As depicted above, this framework allows a developer to write a small amount of Go code (green box) focused on parsing a new API protocol, and this Go code is able to take full advantage of Cilium features including high-performance redirection to/from Envoy, rich L7-aware policy language and access logging, and visibility into encrypted traffic traffic via kTLS (coming soon!). In sum, you as the developer need only worry about the logic of parsing the protocol, and Cilium + Envoy + BPF do the heavy-lifting. This guide uses simple examples based on a hypothetical “r2d2” protocol (see proxylib/r2d2/r2d2parser.go) that might be used to talk to a simple protocol droid a long time ago in a galaxy far, far away. But it also points to other real protocols like Memcached and Cassandra that already exist in the cilium/proxylib directory. A standard RESTful HTTP request has a GET/POST/PUT/DELETE methods (operation) and URLs (resource). A database protocol like MySQL has SELECT/INSERT/UPDATE/DELETE actions (operation) on a combined database + table name (resource). A queueing protocol like Kafka has produce/consume (operation) on a particular queue (resource). In our examples, the ‘’r2d2’’ example, we’ll use a basic set of operations (READ/WRITE/HALT/RESET). The READ and WRITE commands also support a ‘filename’ resource, while HALT and RESET have no resource. Next, get your head wrapped around how a protocol looks terms of the raw data, as this is what you’ll be parsing. Try looking for official definitions of the protocol or API. Official docs will not only help you quickly learn how the protocol works, but will also help you by documenting tricky corner cases that wouldn’t be obvious just from regular use of the protocol. For example, here are example specs for Redis Protocol , Cassandra Protocol, and AWS SQS . encoding / framing : how to recognize the beginning/end of individual requests/replies within a TCP stream. This typically involves reading a header that encodes the overall request length, though some simple protocols use a delimiter like ‘’rn’’ to separate messages. request/reply fields : for most protocols, you will need to parse out fields at various offsets into the request data in order to extract security-relevant values for visibility + filtering. In some cases, access control requires filtering requests from clients to servers, but in some cases, parsing replies will also be required if reply data is required to understand future requests (e.g., prepared-statements in database protocols). message flow : specs often describe various dependencies between different requests. Basic protocols tend to follow a simple serial request/reply model, but more advanced protocols will support pipelining (i.e., sending multiple requests before any replies have been received). 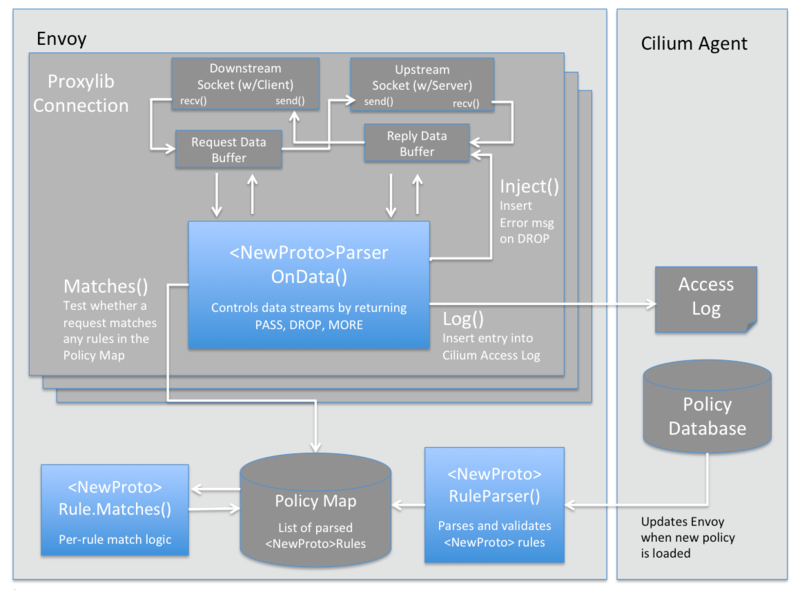 protocol errors : when a Cilium proxy denies a request based on policy, it should return a protocol-specific error to the client (e.g., in HTTP, a proxy should return a ‘‘403 Access Denied’’ error). Looking at the protocol spec will typically indicate how you should return an equivalent ‘’Access Denied’’ error. Sometimes, the protocol spec does not give you a full sense of the set of commands that can be sent over the protocol. In that case, looking at higher-level user documentation can fill in some of these knowledge gaps. Here are examples for Redis Commands and Cassandra CQL Commands . In our example r2d2 protocol, we’ll keep the spec as simple as possible. It is a text-only based protocol, with each request being a line terminated by ‘’rn’‘. A request starts with a case-insensitive string command (“READ”,”WRITE”,”HALT”,”RESET”). If the command is “READ” or “WRITE”, the command must be followed by a space, and a non-empty filename that contains only non whitespace ASCII characters. Look for open source Go library/code that can help. Is there existing open source Go code that parse your protocol that you can leverage, either directly as library or a motivating example? For example, the tidwall/recon library parses Redis in Go, and Vitess parses MySQL in Go. Wireshark dissectors also has a wealth of protocol parsers written in C that can serve as useful guidance. Note: finding client-only protocol parsing code is typically less helpful than finding a proxy implementation, or a full parser library. This is because the set of requests a client parsers is typically the inverse set of the requests a Cilium proxy needs to parse, since the proxy mimics the server rather than the client. Still, viewing a Go client can give you a general idea of how to parse the general serialization format of the protocol. While this dev VM is running, you can open additional terminals to the Cilium dev VM by running ‘’vagrant ssh’’ from within the cilium source directory. Within both newproto.go and newproto_test.go update references to r2d2 with your protocol name. Search for both ‘’r2d2’’ and ‘’R2D2’‘. Implementing a parser requires you as the developer to implement three primary functions, shown as blue in the diagram below. We will cover OnData() in this section, and the other functions in section Step 9: Add Policy Loading and Matching. The beating heart of your parsing is implementing the onData function. You can think of any proxy as have two data streams, one in the request direction (i.e., client to server) and one in the reply direction (i.e., server to client). OnData is called when there is data to process, and the value of the boolean ‘reply’ parameter indicates the direction of the stream for a given call to OnData. The data passed to OnData is a slice of byte slices (i.e., an array of byte arrays). PASS x : The next x bytes in the data stream passed to OnData represent a request/reply that should be passed on to the server/client. The common case here is that this is a request that should be allowed by policy, or that no policy is applied. Note: x bytes may be less than the total amount of data passed to OnData, in which case the remaining bytes will still be in the data stream when onData is invoked next. x bytes may also be more than the data that has been passed to OnData. For example, in the case of a protocol where the parser filters only on values in a protocol header, it is often possible to make a filtering decision, and then pass (or drop) the size of the full request/reply without having the entire request passed to Go. Text-based Protocols : For text-based protocols that use a delimiter like “rn”, it is common to simply check if the delimiter exists, and return MORE 1 if it does not, as technically one more character could result in the delimiter being present. See the sample r2d2 parser as a basic example of this. Binary-based protocols : Many binary protocols have a fixed header length, which containers a field that then indicates the remaining length of the request. In the binary case, first check to make sure a full header is received. Typically the header will indicate both the full request length (i.e., framing), as well as the request type, which indicates how much of the full request must be read in order to perform filtering (in many cases, this is less than the full request). A binary parser will typically return MORE if the data passed to OnData is less than the header length. After reading a full header, the simple approach is for the parser to return MORE to wait for the full request to be received and parsed (see the existing CassandraParser as an example). However, as an optimization, the parser can attempt to only request the minimum number of bytes required beyond the header to make a policy decision, and then PASS or DROP the remaining bytes without requiring them to be passed to the Go parser. DROP x : Remove the first x bytes from the data stream passed to OnData, as they represent a request/reply that should not be forwarded to the client or server based on policy. Don’t worry about making onData return a drop right away, as we’ll return to DROP in a later step below. ERROR y : The connection contains data that does not match the protocol spec, and prevents you from further parsing the data stream. The framework will terminate the connection. An example would be a request length that falls outside the min/max specified by the protocol spec, or values for a field that fall outside the values indicated by the spec (e.g., wrong versions, unknown commands). If you are still able to properly frame the requests, you can also choose to simply drop the request and return a protocol error (e.g., similar to an ‘’HTTP 400 Bad Request’’ error. But in all cases, you should write your parser defensively, such that you never forward a request that you do not understand, as such a request could become an avenue for subverting the intended security visibility and filtering policies. See proxylib/types.h for the set of valid error codes. See proxylib/proxylib/parserfactory.go for the official OnData interface definition. Keep it simple, and work iteratively. Start out just getting the framing right. Can you write a parser that just prints out the length and contents of a request, and then PASS each request with no policy enforcement? One simple trick is to comment out the r2d2 parsing logic in OnData, but leave it in the file as a reference, as your protocol will likely require similar code as we add more functionality below. Use unit tests to drive your development. Its tempting to want to first test your parser by firing up a client and server and developing on the fly. But in our experience you’ll iterate faster by using the great unit test framework created along with the Go proxy framework. This framework lets you pass in an example set of requests as byte arrays to a CheckOnDataOK method, which are passed to the parser’s OnData method. CheckOnDataOK takes a set of expected return values, and compares them to the actual return values from OnData processing the byte arrays. A great way to get the exact data to pass in is to copy the data from the Wireshark captures mentioned above in Step #2. You can see the full application layer data streams in Wireshark by right-clicking on a packet and selecting “Follow As… TCP Stream”. If the protocol is text-based, you can copy the data as ASCII (see r2d2/r2d2parser_test.go as an example of this). For binary data, it can be easier to instead select “raw” in the drop-down, and use a basic utility to convert from ascii strings to binary raw data (see cassandra/cassandraparser_test.go for an example of this). This will build the latest version of your parser and unit test files and run the unit tests. Thinking back to step #1, what are the critical fields to parse out of the request in order to understand the “operation” and “resource” of each request. Can you print those out for each request? Use the unit test framework to pass in increasingly complex requests, and confirm that the parser prints out the right values, and that the unit tests are properly slicing the datastream into requests and parsing out the required fields. rejection of malformed requests (return ERROR). For certain advanced cases, it is required for a parser to store state across requests. In this case, data can be stored using data structures that are included as part of the main parser struct. See CassandraParser in cassandra/cassandraparser.go as an example of how the parser uses a string to store the current ‘keyspace’ in use, and uses Go maps to keep state required for handling prepared queries. Once you have the parsing of most protocol messages ironed out, its time to start enforcing policy. Matches : This function implements the basic logic of comparing data from a single request against a single policy rule, and return true if that rule matches (i.e., allows) that request. <NewProto>RuleParser : Reads key value pairs from policy, validates those entries, and stores them as a <NewProto>Rule object. See r2d2/r2d2parser.go for examples of both functions for the r2d2 protocol. You’ll also need to update OnData to call p.connection.Matches(), and if this function return false, return DROP for a request. Note: despite the similar names between the Matches() function you create in your newprotoparser.go and p.connection.Matches(), do not confuse the two. Your OnData function should always call p.connection.Matches() rather than invoking your own Matches() directly, as p.connection.Matches() calls the parser’s Matches() function only on the subset of L7 rules that apply for the given Cilium source identity for this particular connection. Simply dropping the request from the request data stream prevents the request from reaching the server, but it would leave the client hanging, waiting for a response that would never come since the server did not see the request. Instead, the proxy should return an application-layer reply indicating that access was denied, similar to how an HTTP proxy would return a ‘‘403 Access Denied’’ error. Look back at the protocol spec discussed in Step 2 to understand what an access denied message looks like for this protocol, and use the p.connection.Inject() method to send this error reply back to the client. See r2d2/r2d2parser.go for an example. Note: p.connection.Inject() will inject the data it is passed into the reply datastream. In order for the client to parse this data correctly, it must be injected at a proper framing boundary (i.e., in between other reply messages that may be in the reply data stream). If the client is following a basic serial request/reply model per connection, this is essentially guaranteed as at the time of a request that is denied, there are no other replies potentially in the reply datastream. But if the protocol supports pipelining (i.e., multiple requests in flight) replies must be properly framed and PASSed on a per request basis, and the timing of the call to p.connection.Inject() must be controlled such that the client will properly match the Error response with the correct request. See the Memcached parser as an example of how to accomplish this. Cilium also has the notion of an ‘’Access Log’‘, which records each request handled by the proxy and indicates whether the request was allowed or denied. Find the standard docker container for running the protocol server. Often the same image also has a CLI client that you can use as a client. Note that we run both containers with labels that will make it easy to refer to these containers in a cilium network policy. Note that we have the client container run the sleep command, as we will use ‘docker exec’ to access the client CLI. Use ‘’cilium endpoint list’’ to identify the IP address of the protocol server. Note that policy is now showing as ‘’Enabled’’ for the Cassandra server on ingress. To install a new policy, first delete, and then run ‘’cilium policy import’’ again. For example, the following policy would allow select statements on a specific set of tables to this Cassandra server, but deny all other queries. If you rebase or other files change, you need to run both commands from the top level directory. Cilium agent default to running as a service in the development VM. However, the default options do not include the ‘’–debug-verbose=flow’’ flag, which is critical to getting visibility in troubleshooting Go proxy frameworks. So it is easiest to stop the cilium service and run the cilium-agent directly as a command in a terminal window, and adding the ‘’–debug-verbose=flow’’ flag. Before submitting this change to the Cilium community, it is recommended that you add runtime tests that will run as part of Cilium’s continuous integration testing. Usually these runtime test can be based on the same container images and test commands you used for manual testing. The best approach for adding runtime tests is typically to start out by copying-and-pasting an existing L7 protocol runtime test and then updating it to run the container images and CLI commands specific to the new protocol. See cilium/test/runtime/cassandra.go as an example that matches the use of Cassandra described above in the manual testing section. Note that the json policy files used by the runtime tests are stored in cilium/test/runtime/manifests, and the Cassandra example policies in those directories are easy to use as a based for similar policies you may create for your new protocol. Many protocols have advanced features or corner cases that will not manifest themselves as part of basic testing. Once you have written a first rev of the parser, it is a good idea to go back and review the protocol’s spec or list of commands to see what if any aspects may fall outside the scope of your initial parser. For example, corner cases like the handling of empty or nil lists may not show up in your testing, but may cause your parser to fail. Add more unit tests to cover these corner cases. It is OK for the first rev of your parser not to handle all types of requests, or to have a simplified policy structure in terms of which fields can be matched. However, it is important to know what aspects of the protocol you are not parsing, and ensure that it does not lead to any security concerns. For example, failing to parse prepared statements in a database protocol and instead just passing PREPARE and EXECUTE commands through would lead to gaping security whole that would render your other filtering meaningless in the face of a sophisticated attacker. At a minimum, the policy examples included as part of the runtime tests serve as basic documentation of the policy and its expected behavior. But we also encourage adding more user friendly examples and documentation, for example, Getting Started Guides. cilium/Documentation/gettingstarted/cassandra.rst is a good example to follow. Also be sure to update Documentation/gettingstarted/index.rst with a link to this new getting started guide. With that, you are ready to post this change for feedback from the Cilium community. Congrats!